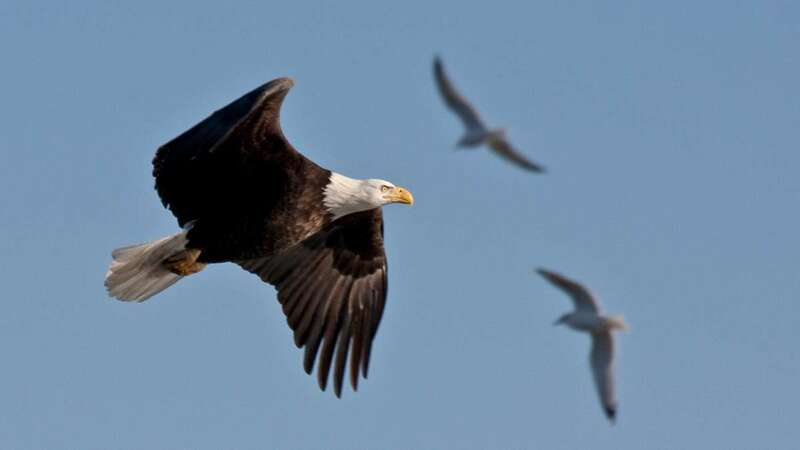 Eagles soar along the Illinois and Mississippi rivers and attract attention in state parks during January and February. Beginning in January, nature lovers and bird watchers can enjoy several opportunities to view eagles in their natural habitats along the Illinois and Mississippi rivers. The viewing events are great reasons for getting the family outdoors and into nature during the midst of winter. Starved Rock Bald Eagle Watch Weekend: The Bald Eagle Watch Weekend in and around Starved Rock State Park is set for Jan. 26 and 27. Activities are scheduled from 9 a.m. both days at the Illinois Waterway Lock and Dam Visitor Center, Starved Rock Visitor Center and Starved Rock Lodge. Fulton-Mason Eagle Day: Join us for the annual Fulton-Mason Eagle Day event on Sat., Feb. 2 with activities including live raptor programs, hands-on activities and crafts for kids, and bird watching in various locations in Lewistown and Havana, Illinois. The event is free and for all ages. Fulton-Mason Eagle Day is sponsored by the City of Lewistown, City of Havana, Forbes Biological Station, Havana Oktoberfest Committee, Illinois River Biological Station, Illinois River Road National Scenic Byway, Illinois State Museum-Dickson Mounds, Therkildsen Field Station at Emiquon, The Nature Conservancy, USFWS Illinois River Refuges Complex, Lewistown Chamber of Commerce, Spoon River Electric Coop, and Plum Hill Vacation Rental Properties.